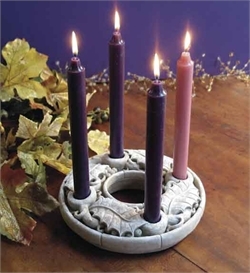 Small Advent Wreath Hand Carved Hand Cast Stone Made in U.S.A.
Home > Nativities Sets > USA Nativities > Small Advent Wreath Hand Cast Stone Made in U.S.A.
Our Advent wreath has an old world appearance. The texture and weight of this graceful sculpture has the look of hand carved ornamental stone. A true classic for the holidays. Natural stone color. Please note candles are not included with this product.